Today I bring you Vanja from Serbia who goes by the username SweetNails24 on Nail Magazine's Nail Art Gallery. This is another self taught nail tech! I can't believe how many of these are out there :) It shows that if you're determined enough, you can do anything. Vanja is doing extremely well, she's one of my favorite people to keep an eye out for new posts. She uses Professionail's products (which is a world wide company that I have actually never heard of before). 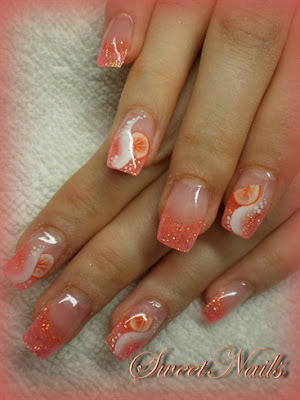 Either way, her nail sculpting and artwork is beautiful! As always, I like to let the nails speak for themselves. 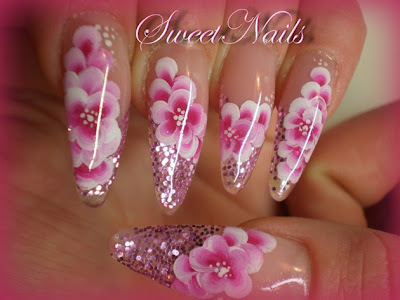 So if you like her work please visit her Facebook page or her Nail Art Gallery by Nails Magazine. I'm sure she'd appreciate it! And don't foget to enter Diva Pirates 1 year Anniversary Polish Give Away! I love her work too!